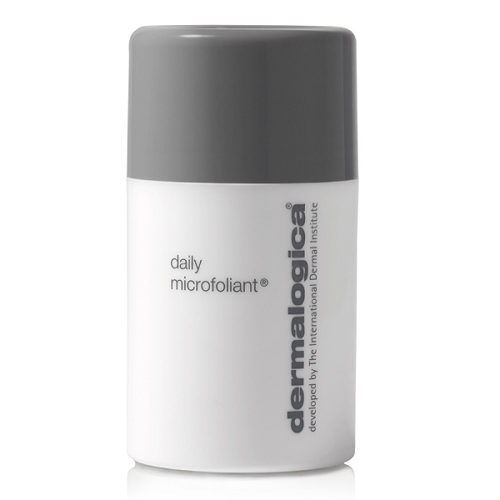 Dermalogica Daily Microfoliant 0.45 oz. This unique, Rice-based enzyme powder activates upon contact with water, releasing Papain, Salicylic Acid and Rice Enzymes to smooth the skin and accelerate cell renewal. Our unique Skin Brightening Complex of Rice Bran, Salicylic Acid, Green Tea, Grapefruit and Licorice helps to balance uneven skin pigmentation. Papain and other active agents derived from Rice Bran and Rice Extract help to regulate melanin production while micro-exfoliating dead cells. A super-soothing blend of Green Tea, Ginkgo and Colloidal Oatmeal calms inflammation, leaving the skin extraordinarily clear and refreshed. Gentle enough to use on a daily basis. Contains no artificial fragrance or color. Professional recommendation advised.